His hands shook. He choked out his words. "Look at me," Mohammed Rahad said as he arrived at the Lebanese-Syrian border, a chaotic collection of makeshift buildings, tents and trailers among the arid hills and thorny brambles. He held out his trembling hands and pointed to his two children. "They want to know why are we here," he said. "We have nothing." 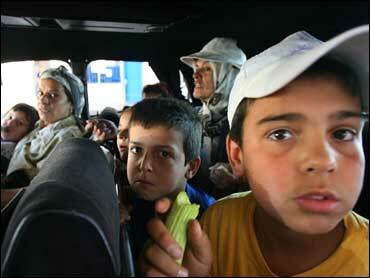 The family is among more than 200,000 Lebanese fleeing to Syria, according to the Syrian Red Crescent. Scores of people on foot stood in line to get into Syria. Scores more waited in cars — a collection of mostly well-used vehicles overflowing with whatever the refugees could carry. In areas where refugees have fled, the population is ten times what it was a week ago, reports CBS News correspondent Lee Cowan. Food and water are running out, and it's neither safe for aid workers to go in nor refugees to venture out. "What's left of my country?" Rahad asked. Others waiting with him Saturday listened as he shouted in frustration. "I will take a bomb and put it on me ... and explode it if I could find any Israeli. I would explode it and kill myself and them." He gestured as if stuffing a bomb inside his sweat-stained shirt. "I am not a terrorist, but today if I could, I would blow myself up. It is enough. I want to be a bomb. Israel comes with airplanes and tons of explosives. I want to say to (U.N. Secretary-General) Kofi Annan. Enough!" Sue Mansour made the dangerous drive from Beirut with her three sons. The Lebanese-American grasped her U.S. passport and tried to push through the hot and angry crowd to the immigration desk. She had come to Lebanon to attend a wedding and arrived July 11, one day before the Israeli bombing began. She had been trying to leave ever since. She had given up on the U.S. government-sponsored sea and helicopter evacuation out of Beirut, although she and the children were on the American list of people eligible for evacuation. "We went every day, day after day after day to the place they told us to come but after hours and hours they said, 'Sorry come back tomorrow."' Finally, they gave up and headed for Syria. The U.N. estimates there are 700,000 refugees from the fighting, and Annan has said he fears a humanitarian disaster. Abdul Rahman Attar, head of the Syrian Red Crescent told The Associated Press in Damascus about 200,000 had crossed from Lebanon into Syria, and about 10 percent have received help from the Red Crescent. Attar said he has appealed to the International Committee of the Red Cross for more aid and was critical that so little had come to Syria from Europe and from fellow Arab nations. "We can manage for another 10 or 15 days. But what about all the other countries — the Arab countries and countries in Europe? They are not donating anything (to Syria). We get some donations coming in, 10, 15 or 20 trucks with aid. But that doesn't mean anything. The other countries all they are doing is talking," he complained. The Syrian Red Crescent has mobilized teams to shepherd refugees to schools that have been converted into hostels, or to mosques or private homes that have been opened to refugees. Abir Hamid, a 28-year-old mother of two, said she came to Syria after deciding the war would not end soon. Her 15-year-old sister, Nancy, said they had been on the road in a taxi for eight hours as they fled Beirut. The two women were vocal supporters of Hezbollah. Nancy interrupted her sister's story of their escape to say: "I love Hezbollah. Everyone in Lebanon loves them." Eleven-year-old Wadeya Abu Akar wants to be an engineer when he grows up but he isn't sure it will be in Lebanon. A refugee from Taanayel in the Bekaa Valley, targeted by Israeli jets as a stronghold of Hezbollah, Wadeya had never heard a bomb fall before. "I was just so afraid. I tried to hide but I didn't know where to go. I made my father leave our home. He said, 'No. We will stay,' but I couldn't stay. I said, 'Please I want to leave.' I was so afraid." At the Al Jadedeh crossing, Daman Mehraz of the Syrian Red Crescent, said the flow of refugees from Lebanon had been steady. Added to the burden are 300 Palestinians who fled the fighting in Gaza. The United Nations High Commissioner for Refugees had been called to intervene. For the last two days the Palestinians have lived in a nearby mosque unable to get into Syria because they have no travel documents. Abir Hamid, a young mother of two, was uncertain when she could return home to Lebanon. "But I think that when I return there will be nothing left," she said.